I was reluctant to post on this, since its only game connection is that it was directed by Uwe Boll, who also directed lots of game-to-film adaptations - to the hatred of pretty much the entire community. Perhaps if I double post no one will notice? MAJOR SPOILERS ahoy. I’ll level with you. This is the only Uwe Boll film I’ve ever seen. Tunnel Rats came after a long string of his game films (House of the Dead, Alone in the Dark, BloodRayne, Dungeon Siege, Postal and BloodRayne II), and in terms of pure entertainment, it’s not bad. In terms of everything else, it’s an incredibly glorious train wreck. 1) I love Vietnam war films. As a conflict which I have absolutely no emotional connection to, but which is recent enough to seem memorable in a way that WWII isn’t (and which is something everyone with grandparents is connected to), I find the Vietnam war fascinating. 2) The film has no script; all lines were adlibbed. As a concept this is incredible and something I had to see. I studied acting as one of my choices in high school, and am prone to spontaneous moments of theatrics, so the idea of an entire film being made up by the actors proved too tempting. Plus it was $4 delivered off eBay! Anything which opens with a rendition of the phenomenal Zager And Evans song ‘In The Year 2525’ is going to catch my interest (now there's a golden oldie, for our younger readers). Ironically, the song may actually have only been released after the film is set (depending on how inaccurate Wikipedia is), and it has nothing to do with the rest of the film - still, a great opening. The rest of the film proved very entertaining, especially the made up dialogue, which is excruciatingly ridiculous throughout. The action too was pretty cool, with big explosions, very graphic gory deaths, and some claustrophobic moments in the tunnels. Oh, and everyone, absolutely everyone, dies in the end. Which is something I like in films. None of this means it’s a good movie though, and reading IMDB’s reader reviews tells me it’s horribly inaccurate - which is something even I could recognise when I saw the Vietcong wearing steel helmets. Several IMDB reviewers who served in the conflict wrote out long lists of inaccuracies, stating that the film is an insult to anyone who was there, lambasting it in the process. I can’t comment on the accuracy, but I can say that it’s entertaining if only for the wrong reasons - and only if you have no connection to what took place. 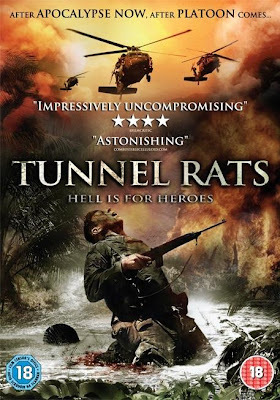 If Tunnel Rats is indicative of Boll’s other films, I can understand why gamers et al hate his work. For me, I’ve spent beer-fuelled Saturdays watching a lot worse. The 4 stars and 'astonishing' are pretty much proof that companies will buy good reviews just for the box quote. Also House of the Dead actully got a sequel but it wasn't directed by Boll, somehow it was worse than the 1st. Aww man, I had written a paragraph on the box quotes, but then removed it to make this post shorter. They're kind of taken out of context if you visit the actual websites, which is kinda funny! He actually had a game come out, based on the movie. Yeah, I figured as much myself. like "this movie is impressively uncompromising in it's audacity to call itself a masterwork of cinema" or "it's astonishing that Uwe Boll still has a career", something like that. It reminds me of this old Hsu and Chan strip (god I miss those so much!) back in EGM that said publishers can make decent boxquotes out of the worst reviews, and it had a ad that used the quote "Not...that...bad!". Well, the famous example is Bubsy 3D, and that mangled EGM quote from a negative preview.